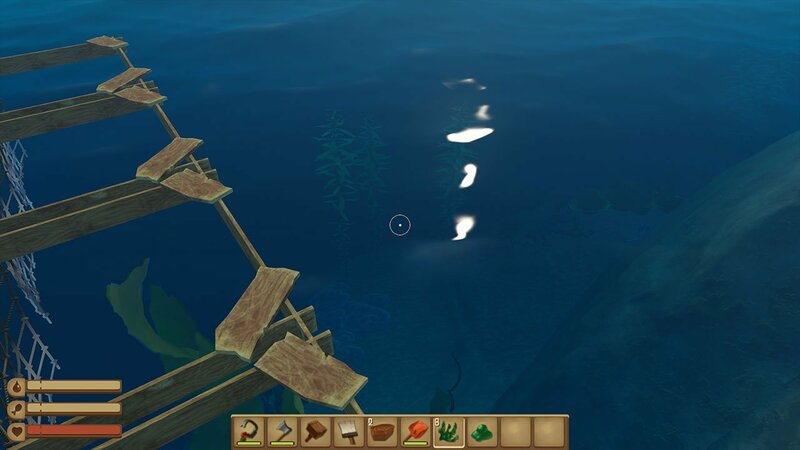 Seaweed is a crafting material in Raft, mainly used in the creation of flippers. It can be found underwater, and can also be turned into Vine Goo. If you wish to do this, you will need a Smelter. There aren’t a lot of recipes currently in the game that use Seaweed as a recipe, although this may change in the future. Raft is currently in an Early Access state, and I’m sure we will see a lot of developments over the coming months. For now though, this guide works. If you want some more guides for Raft, we’ve covered a lot on our site here. As I mentioned before, Seaweed can be found under water. Thankfully, it’s not deep enough that you really stand a chance of drowning. It’s possible, but unlikely. Your biggest threat is going to be Sharks. For that reason, I recommend you craft some Shark Bait if possible to ensure that you aren’t attacked whilst gathering. You should also use a sail to steer yourself as close to seaweed as possible, allowing you to quickly jump back on the raft. For now, Seaweed is located around the small islands on ledges. You can see if from above the surface, it looks like the image above. Once collected, you can turn it into Vine Goo by shoving it into a smelter.